Accountants are professionals who offer financial advice to their employers and also take care of company/business audits, taxation, financing, recovery, balance sheet and much more. As such, a Sample Job Description for such a position should be highly technical and reinforce your knowledge and expertise in the field. The message needs to be concise, crisp and build the confidence of the employer. After all, he/she would depend on you with his/her financials. It’s a huge responsibility. 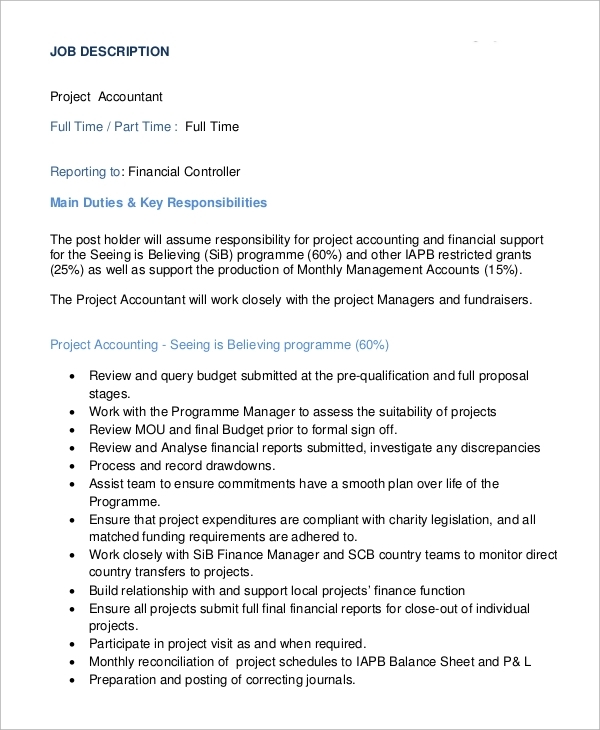 An accounts manager is supposed to be responsible for a lot of things including employer-client relationships, developing new business opportunities, apart from the financial audit roles. As such, the Job Description should meet objectives like recruiting, orienting, training, scheduling, assigning, counseling, coaching, planning, monitoring and more. 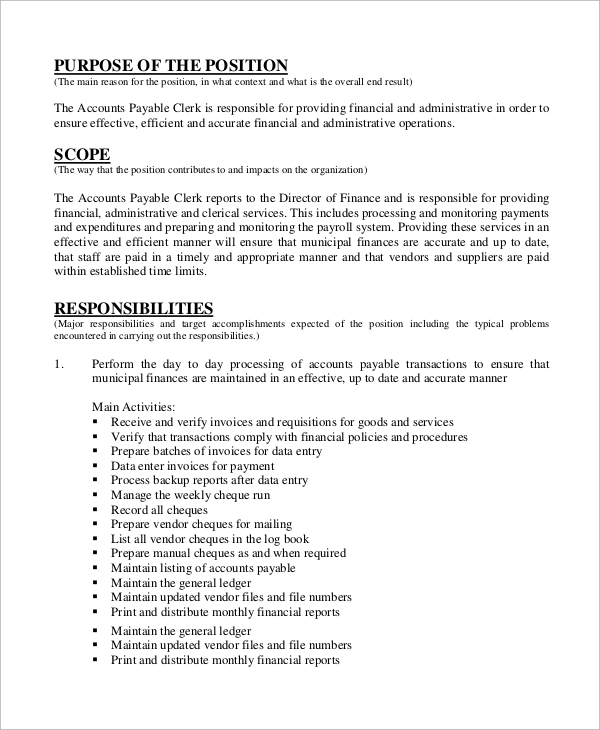 Accounts executive, also called accounts handlers, act as a link between the employer and the clients. The candidate is required to understand the company objectives and come up with administrative campaigns to achieve the goals. Accounting assistants offer administrative support to senior accounts managers and who undertakes clerical tasks including bookkeeping, handling emails, typing, preparing statutory accounts and more. 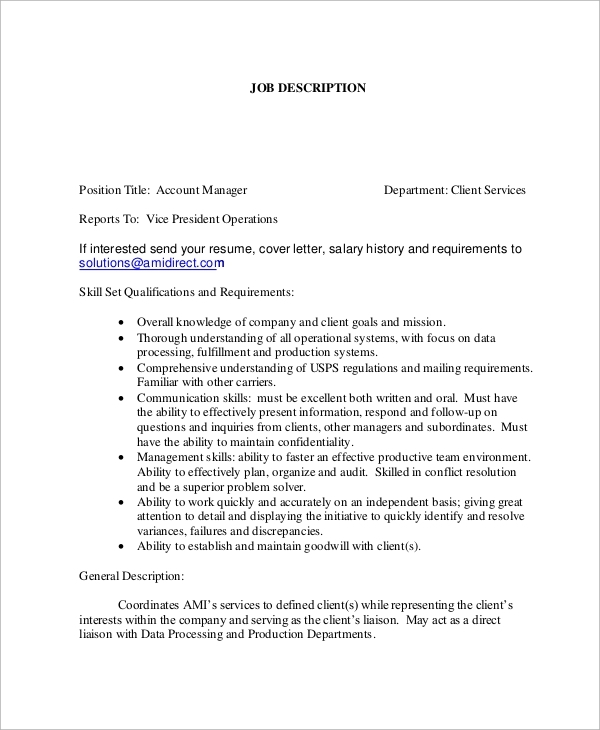 This template shows you how to come up with an impressive description for your resume. What Makes an Accounting Job Interesting? As opposed to the common belief, the work of a modern accountant is not just limited to handling financials and sitting with numbers. Today, it is more of a people-oriented position where you will need to work on the desk, indulge in interactions and motivate clients and customers. The very dynamicity of the position also makes the job of an accountant a very crucial element for a company’s success. As such, recruiters would be looking for profiles which offer a lot to the platter and not just certifications, qualifications, and experience. You can also see the Custodian Job Description Samples. Project accountants, as the position implies, are hired just for a particular project, and they would be responsible for handling the financial aspects of the project transactions. The description should hint of the experience and expertise in similar positions. 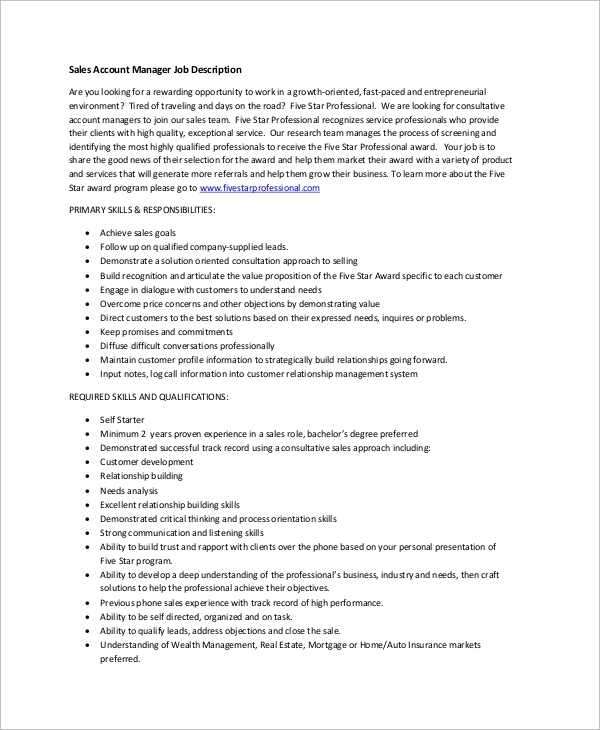 A sales accounts manager is held responsible for handling customer/client relationship while overseeing the sales. The job responsibility is to understand and satisfy customer needs and expectations. 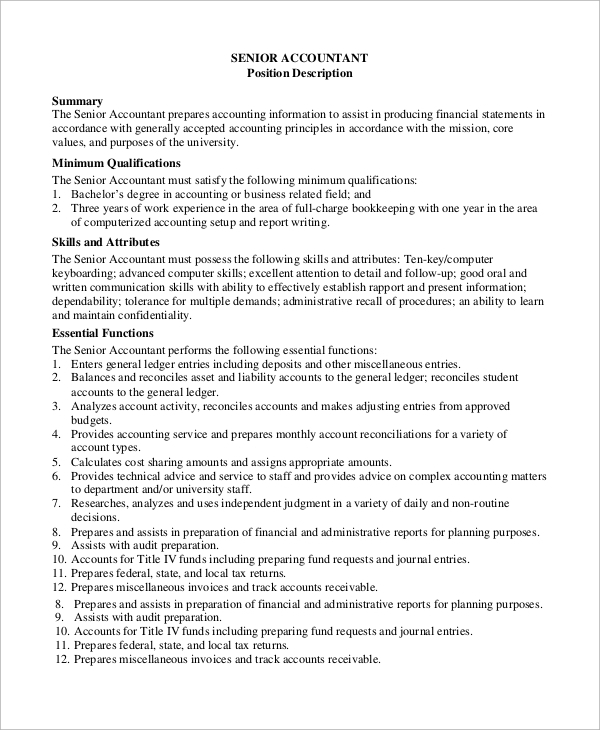 How to write an impressive Accounting Job Resume? The first of things that recruiters look is the experience, previous associations, expertise, qualifications, and certifications. You will need to be good with both numbers and the spoken word. 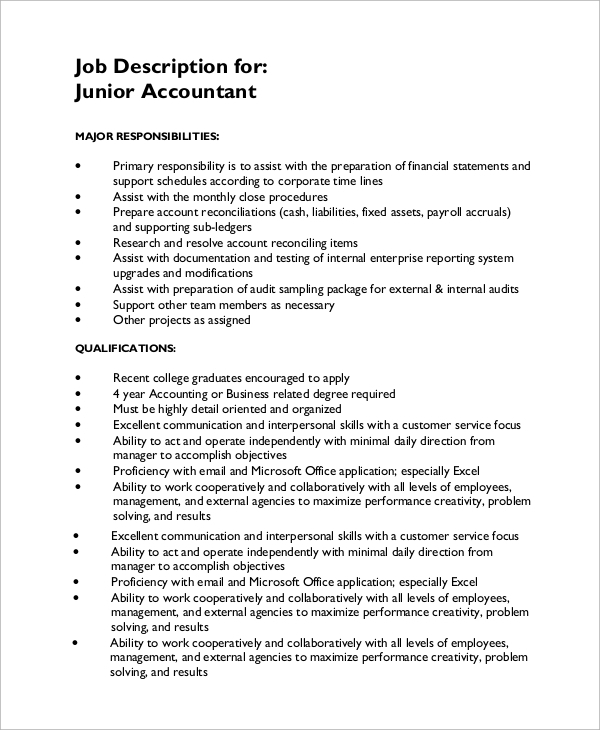 While the perfect accounting resume need not be a literary genius, it should be able to sell the candidate and make him/her sound perfect for the position. Be systematic and introduce your skills one by one. 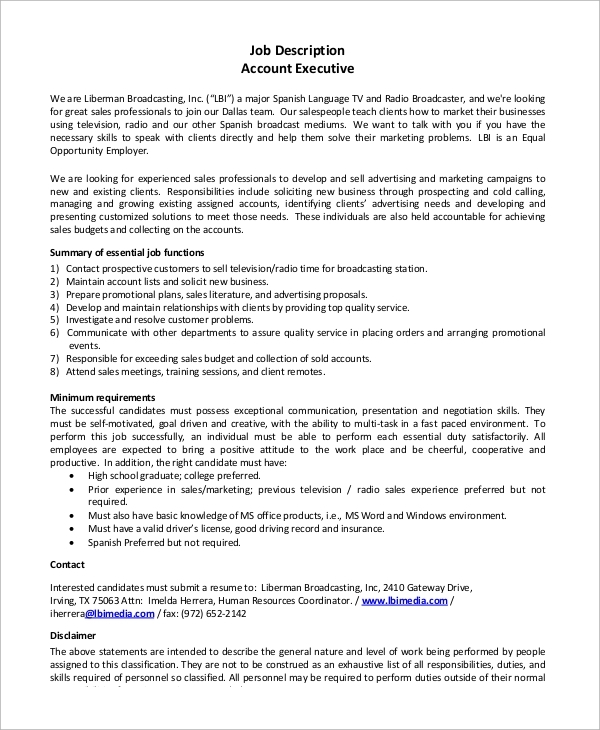 This should at least help you win an interview for the post. To doubly ensure your success with the resume, you can also refer to a variety of job descriptions for a similar post and create something unique of your own. You can also see the Controller Job Description Samples. 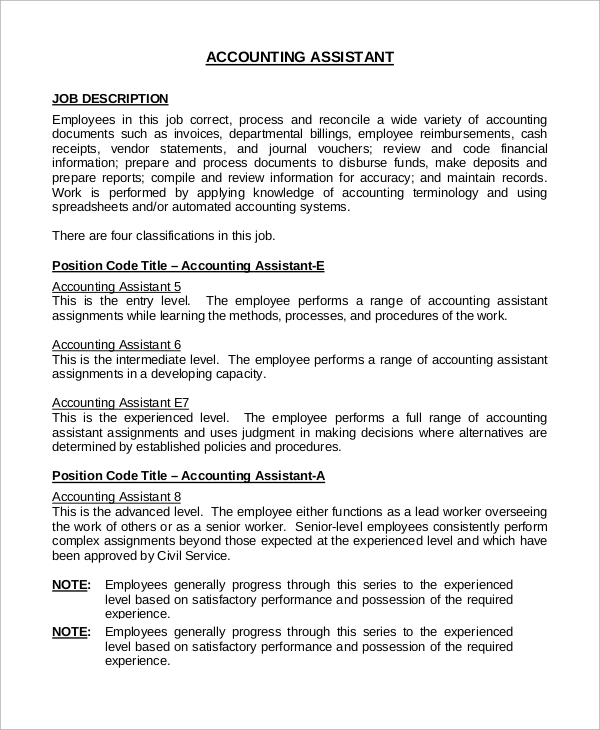 All the above accounting Job Description Samples resumes are offered in PDF and can be downloaded and referred to for creating your statement. However, do understand that these samples are just for reference and are not to be replicated onto your resume.